BANGI, 11 Oct 2013 – How do you create the next Steve Job or Albert Einstein? How do you make sure that when a student graduates he becomes a leader who can change the world instead of merely becoming a manager who does what he is told? While there is no clear cut answer to greatness but a talk on “Stretching Boundaries: Empowering Students with Thinking Skills”, organised by The National University of Malaysia (UKM) today does shed some light on how to be great instead of taking the easy way out by just being mediocres. The talk was given by Tan Sri Dato’ Dr Wan Mohd. Zahid Mohd Noordin, a Governing Council Member of Sime Darby Foundation. 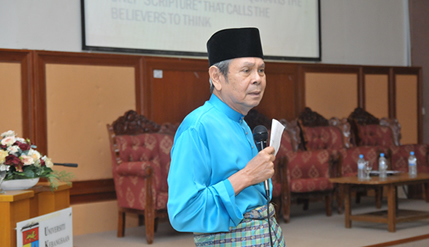 He is also the Chairman of Universiti Teknologi Mara (UiTM). He said the absence of creativity is one of the reasons identified for the exponential growth of mediocrity. People are mediocre because of the lack of creativity and not because it is easier to be mediocre than to be somebody great. He said creativity is liberated thinking where no boundaries are set. To be creative you have to think out of the box and be a rebel, an intellectual rebel. This requires freedom of thinking. Thus a person should not just agree with ideas shoved down his throat by force, consensus or acknowledgement. For it is only when the mind is liberated can the person reap untold and unanticipated benefits not just for himself but also for others. Thus creativity should not be stifled? He blamed the education system for hindering creativity by not allowing students to think for themselves. Students are rewarded for being good memorisers and for agreeing with their teacher’s point of view. He quoted Paulo Freire, famous for his influential work Pedagogy of The oppressed, who says students must liberate their mind from the oppressive drawback of education. An education system where knowledge is deposited in students mind accessing it when needed teaches students to be memorisers rather than thinkers. Education should instead be a stepping stone for students to learn how to think out of the box and discover greatness. It should not be confining the creativity of thinking because it is convenient to do so. Senior management, lecturers and students attended the talk.